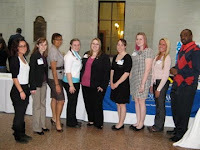 As Major League Baseball starts off its season, ten more independent colleges and over 60 students were at the Statehouse in Columbus to advocate for maintenance of OCOG funds within the Governor's Executive Budget. The bill, HB 153, appropriates $41 million in each year of the biennium for need-based aid to assist low-income students attend Ohio's independent colleges. The students and their campuses were on display in tabletop form for legislators and staff to peruse throughout the day. Statehouse press corps were there to obtain real-life stories of how OCOG made the difference in students' lives and legislators and staff engaged students in conversation over lunch. 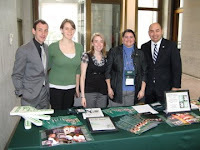 Students were also able to hear from House Education Chair, Rep. Gerry Stebelton and Rep. Jay Goyal. These legislators gave their insight on what it is like to be a state representative in this General Assembly and fielded questions from students on Various issues. By the end of the day, many students had participated in legislative meetings and witnessed legislation being debated in various House Finance Subcommittees being held throughout the day. 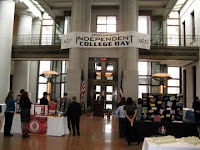 We at AICUO would like to thank those students and campuses who participated in Independent College Day this year, Round 1 or 2, as well as a special thank-you to the legislators who took the time to view the displays and learn more about campuses across our state. We hope they saw the importance of these institutions and were able to to hear from the students why they attended a smaller, liberal arts campus. We are already in the process of planning next year's event, and hope to see upwards of 25 or more campuses next spring.